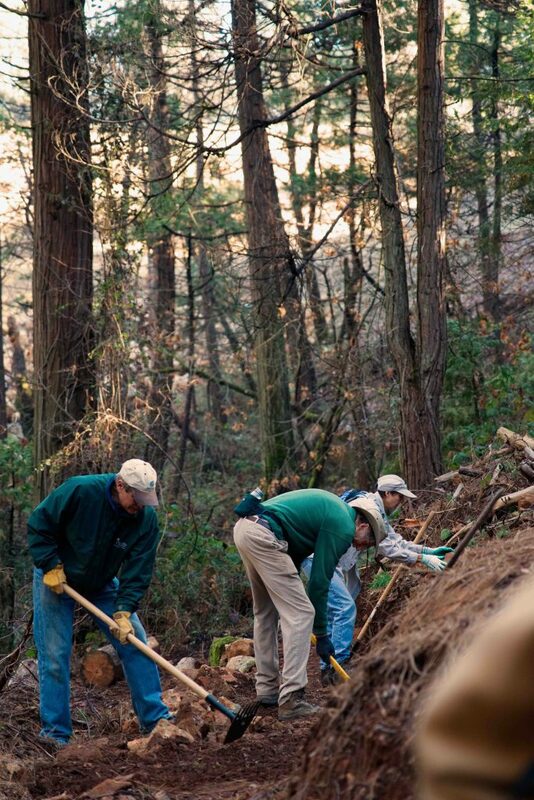 On a glorious warm winter’s day last week, twenty people, ranging in age and backgrounds, came out to volunteer with the Bear Yuba Land Trust (BYLT) to continue the organization’s collaborative efforts with the City of Grass Valley to build a trail near Wolf Creek. 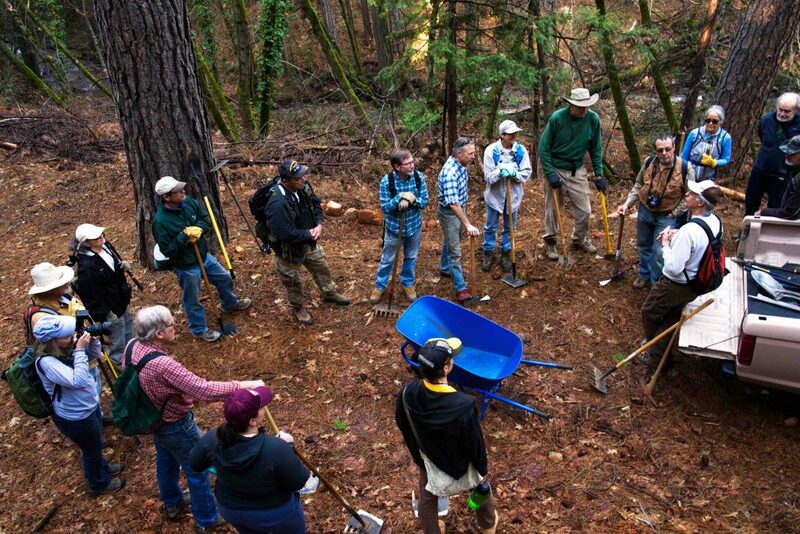 Volunteers were briefed on the vision for the trail, along with the day’s tasks to remove rocks and blackberry bushes; level, grade or build up the single-track trail, and shown how to use the provided tools of a Pulaski (a cross between a pick and an axe used in excavation) and a Mcleod (a two-sided rack/hoe). Four hours later, volunteers stopped for lunch to enjoy the quiet pastoral setting and for a chance to marvel at the section of trail they had just built together as a team, that will be enjoyed by trail and outdoor lovers for many years to come. 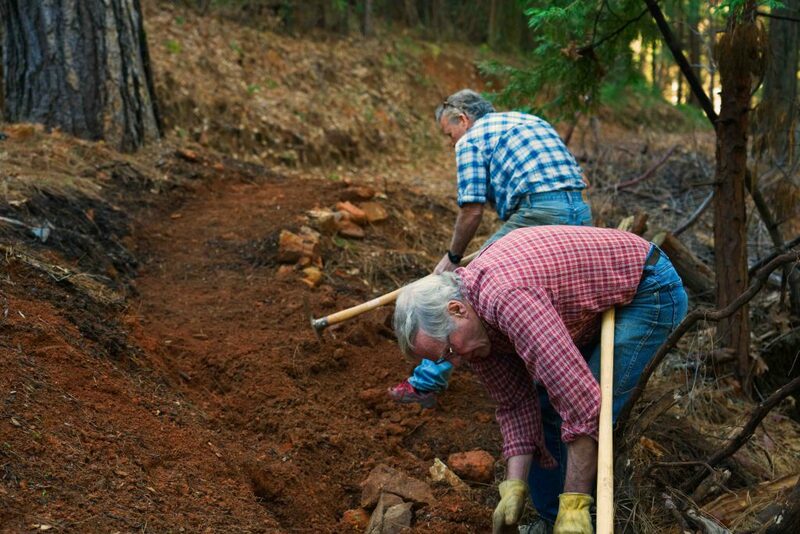 Lawrence is a member of BYLT’s Trail Stewardship Team, a group that builds new trails and maintains over 30 miles of trails in Nevada and Yuba Counties. 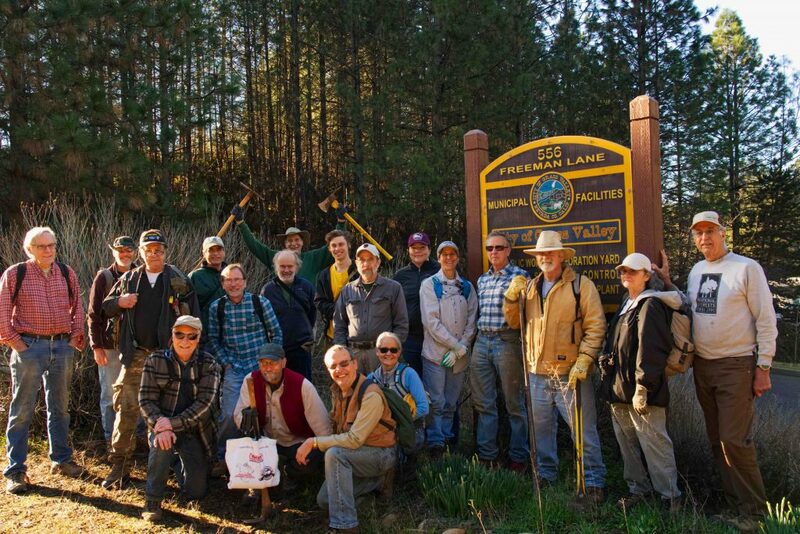 These volunteers are part of BYLT’s network of 200 active volunteers who contribute over 2000 hours each year to building trails, restoring wildlife habitat, collecting data in the field, tending pollinator gardens vegetation management, leading treks, and providing administrative assistance, among other areas. On Saturday, February 23, from 9am to noon, BYLT will host their annual Volunteer Orientation at the Gold Miners Inn in Grass Valley. Attendees will have the opportunity to meet staff and other volunteers, learn about the organization’s extensive program and how to get involved by volunteering. BYLT also offers volunteers to take part in a reward system where they can earn complimentary tickets and passes to member’s only events, along with BYLT merchandise. In addition to the Trail Stewardship Team, BYLT offers opportunities to help with Outreach and Events such as assisting with tabling and fundraising events and the annual Open Spaces and Wild Places Gala. There is the Trail Ambassador program, which is an excellent opportunity for those who have a passion for hiking to get out onto the land and promote a local trail. For those who are fascinated with local ecosystems and organisms, have expert knowledge in a specific environmental topic or have a desire to teach youth about the environment there are the Youth Programs such as the Community BioBlitz Day and youth field trips. And finally Administrative Assistance support is always needed to help with sorting, stuffing and sending letters during a mass mailing event, calling BYLT Members, etc. BYLT is a community-supported non-profit organization that exists to protect and defend the working and natural lands of the Bear and Yuba River watersheds. Since 1990, BYLT has saved more than 15,000 acres of critical Sierra Nevada habitats in addition to building and maintaining 30+ miles of public trails enjoyed by thousands of locals and visitors annually. This has been accomplished with the support and aid of many hard-working volunteers. WHEN: Saturday, February 23, 9:00am-12:00pm, Please arrive around 8:45am to check in, get breakfast snacks and find a seat. INFO: Call (530) 272-5994, email Felicia@BYLT.org or sign up at www.bylt.org/events/event/volunteer-orientation/.